Certificate of Entitlement (COE) prices dropped across all categories except for Category D (motorcycles). Specifically for smaller cars, COE prices plunged to the lowest in nearly nine years. Premiums for Category A (cars up to 1600cc and 130bhp) ended the lowest this year at $23,568 down from $25,000 in the last round. COE premiums for Category B (cars above 1600cc or 130bhp) finished at $31,001, slightly down from $31,101 in the last round. Premiums also fell for Category C (Commercial Vehicles) and Category E (Open) at $27,009 from $27,509 and $30,851 from $30,959 respectively. Only premiums for Category D (motorcycles) increased in this round by 13.5% from $2,989 to $3,399. 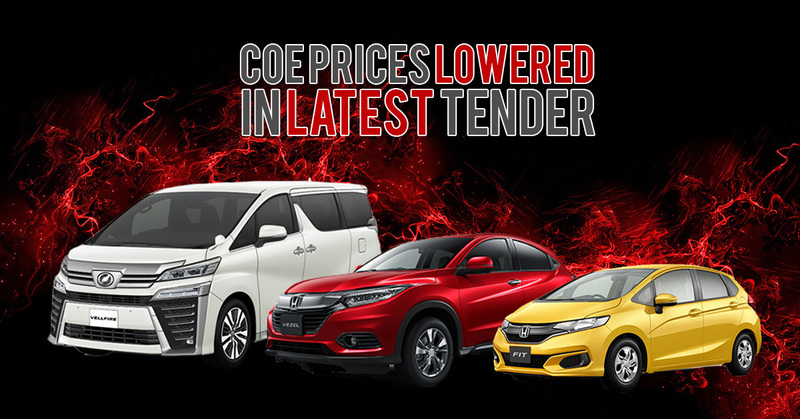 The weaker consumer demand for cars might be due to uncertain economic status for year 2019 hence leading to the huge drop in Category A COE premium in this of round bidding. With the entrance of the new Indonesian ride-hailing firm Gojek, more demand for hybrid cars (typically Category B) was expected. This might be the reason why Category B’s premium did not fall as much as Category A in this round of bidding despite the weaker market demand. Although Gojek does not adopt an asset-owning strategy, its dealer partners will still have to expand their fleet of cars to cater for drivers. It is uncertain if COE will rebound next round. Therefore, if you are considering an upgrade or a new car for this Christmas, now is probably the time to take action while COE is low. Cars & Stars offers a range of cars to suit your needs. Whether you are looking for an economical hatchback, a versatile SUV or a luxurious MPV, we have it all available in our showroom. Drop by our showroom at 50 Ubi Avenue 3 to view the cars available. Alternatively, call us at 6585 5555 to find out more from our sales executive.